Anyway, the person asking also mentioned JPL's page HORIZONS Ephemerides page, which I've certainly found useful at times. Years ago, I tried emailing the site maintainer asking if they might consider releasing the code as open source; it seemed like a reasonable request, given that it came from a government agency and didn't involve anything secret. But I never got an answer. But going to that page today, I find that code is now available! What's available is a massive toolkit called SPICE (it's all in capitals but there's no indication what it might stand for. It comes from NAIF, which is NASA's Navigation and Ancillary Information Facility). 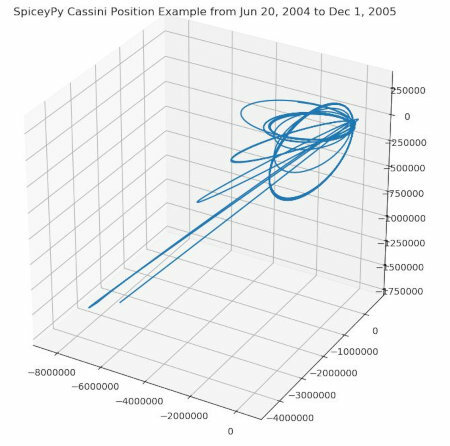 SPICE allows for accurate calculations of all sorts of solar system quantities, from the basic solar system bodies like planets to all of NASA's active and historical public missions. It has bindings for quite a few languages, including C. The official list doesn't include Python, but there's a third-party Python wrapper called SpiceyPy that works fine. The tricky part of programming with SPICE is that most of the code is hidden away in "kernels" that are specific to the objects and quantities you're calculating. For any given program you'll probably need to download at least four "kernels", maybe more. That wouldn't be a problem except that there's not much help for figuring out which kernels you need and then finding them. There are lots of SPICE examples online but few of them tell you which kernels they need, let alone where to find them. After wrestling with some of the examples, I learned some tricks for finding kernels, at least enough to get the basic examples working. I've collected what I've learned so far into a new GitHub repository: NAIF SPICE Examples. The README there explains what I know so far about getting kernels; as I learn more, I'll update it.